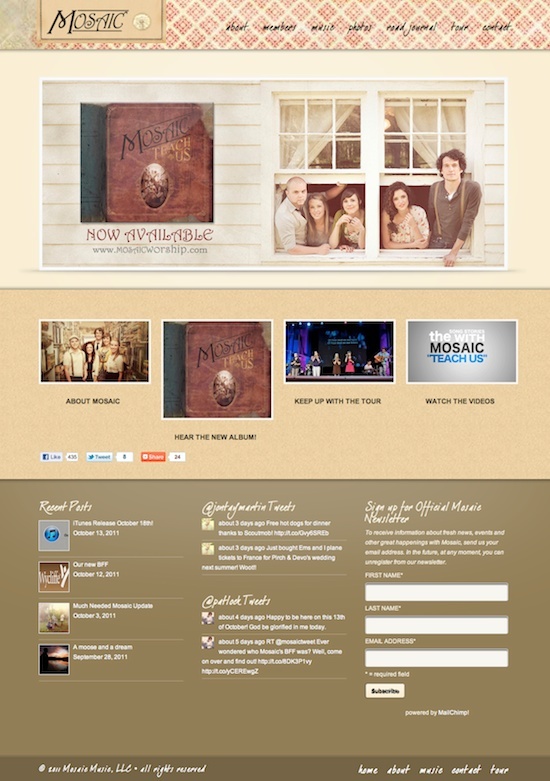 The site for Mosaic included design elements of Mosaic’s CD “Teach Us” which was released in July 2011. The site was built off of the Striking Theme by KaptinLin. AddThis was used for Sharing features like Facebook “Likes” and Twitter, Gravity Forms for custom forms, MailChimp for email signups, and uBillboard as a custom “slider” implementation. The @font-face CSS rule was used to implement web fonts purchased from the new MyFonts.com and FontSquirrel. As a band, Mosaic needed a “music player” and a checkout system for both digital downloads and physically shipped items. They also needed a way for donors to support them on a monthly, recurring basis or by one-time gifts. These eCommerce transactions were handled by PayPal, and Cart66 was used as the shopping cart. This project was completed in July of 2011. Mosaic is a band of 6, 5, 4 musicians who love the Lord. Their genre probably best falls into three categories: Songwriter/Ensemble/Worship. They met at Belmont University as students and have recorded three full-length albums.